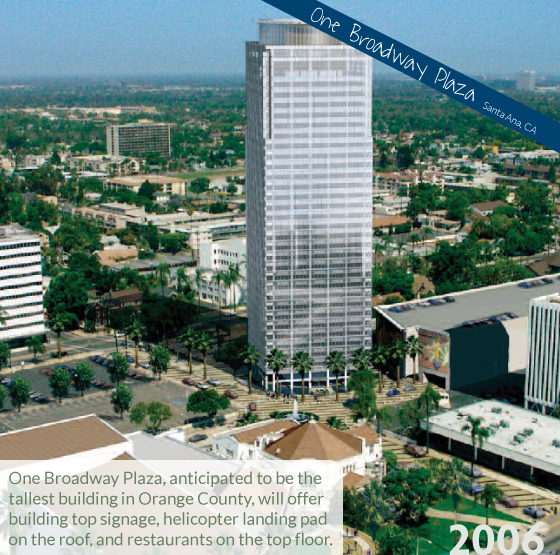 One Broadway Plaza is a planned skyscraper consisting of 37 floors (491 feet tall) of office space at Downtown Santa Ana at 1001 N. Broadway (Source). The developer is Caribou Industries (Source). The last update was found in the City's document stating the developer was going to submit new building plans (Source). A more recent City document that was discussed in the City Council meeting on June 2, 2015 indicates the project is still in the process of attempting to obtain a foundation permit. The developer turned in a plan check submittal to the City's Planning and Building Agency in May, 2015. The document further states given the complexity of the project, the City requires hiring a structural engineering consultant to carry out the plan check for this large project. Prior, through the Request for Proposals process, the City hired Nabih Youssef Associates (NYA) to assist with carrying out the structural plan checks which occurred back in 2008 and 2011. However, states the document, "...but due to a variety of circumstances, building permits were never secured.". Under the Recommended Action heading, the recommendation pertains to hiring NYA for structural plan check of this project and would involve a term consisting of three years that expires June 30, 2018.